Adelheid Dietrich was born in Wittenberg, Germany. 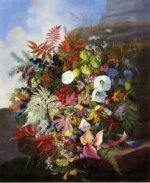 She became known for painting realistic floral still lifes. Her attention to detail and compositional style was influenced by Dutch still life painters during the seventeenth century. 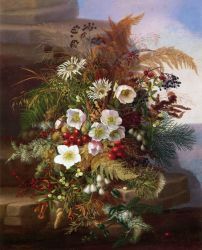 Wild Flowers in a Glass Vase, 1867, is a painting of a plethora of wild flowers in a glass vase placed near the corner edge of a table. The bold colors of the flowers are contrasted beautifully with the black background.